Look at these poached apricots. Don't they look lovely and buttery with that hint of syrup and crushed pistachio on top? Too bad they don't taste that way. Unfortunately, I know exactly why. A couple of years ago, Scott found out that his late Mennonite grandfather used to drink apricot brandy. This was a revelation because Mennonites are not known for drinking . . . um . . . anything. So Scott thought we could get a bottle of apricot brandy and drink it on Christmas Eve when we opened presents, instead of our usual port. I was game, although I got a little nervous when he said the apricot brandy only cost $8. And this was not a small bottle. Christmas Eve came and we eagerly toasted our little glasses of apricot brandy, thinking of Scott's grandfather. The first sip, however, was disappointing. The second sip confirmed what we already knew from the first: we weren't drinking any more of this. It was strangely perfume-y without any real flavour. It was bad. Of course, we couldn't just throw the apricot brandy out, but we couldn't drink it, either. It hid in our cupboard for a long, long time. 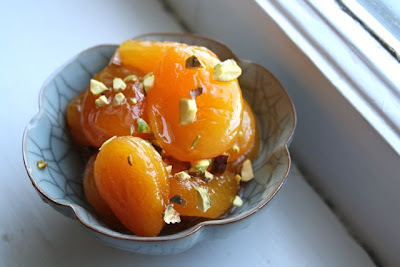 Over that time, we went to a Turkish restaurant and had the loveliest simple dessert of apricots poached in some kind of alcohol. I filed the dessert away in my mind, thinking I would have to try making it some day. The time seemed ripe when I saw particularly fat dried apricots at the grocery store a couple weeks ago. I looked online to find a recipe for poaching them but couldn't really find what I remembered. With nothing to go on, I thought I'd make it up. Looking at our (not so vast) selection of alcohol, I saw the apricot brandy. Genius! Apricots go with apricot brandy! If I have taught you nothing, please remember this: nothing goes with apricot brandy. Don't drink it or cook with it or do anything with it. Pour it down the drain. In fact, that's what I'm going to do right now. I love this photo, and of course the Earl Grey chocolate cake looks divine. 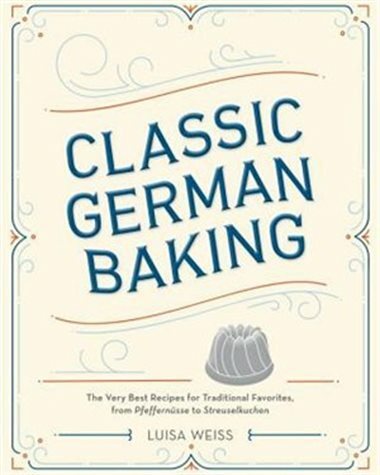 The German in me can hardly wait to make this buttermilk poppyseed cake. I think I might finally be ready to try making my own marshmallow fondant. I once made my own granola bars and they were a crumbling tray of despair. These look better. Does this photo trick you like it did me? 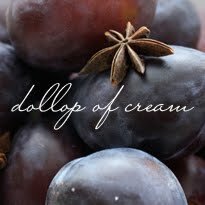 And if I were to try poaching dried apricots again, I might try this. I'll be back, tanned and relaxed, with a recipe in a couple weeks. Aloha!